Global “Fishing” History on CD, we all share in this Garden-of-Eden. (Originally designed as an eBook, download or paperback). 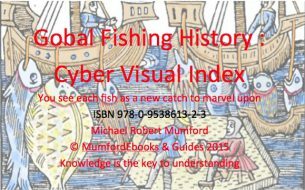 This Cyber Visual Index is my way of combining the sport of fishing with my computer as the hunter-gatherer: the need to preserve fish stocks globally, to protection from over-fishing and polluting the environment. We now have the satisfaction of farming the oceans, seas, rivers and lakes in a sustainable way. Each fish image is a new catch to marvel upon. A David Attenborough moment. Cyber Fishing is here on your screen, your mouse is your rod, fish with each move, not knowing what comes next. For the first-time cyber fishing gives pleasure, let nature’s images do their magic. This visual story shows what a wonderful Garden-of-Eden we can all share in. We can have aquariums of coral flower gardens with tropical fish in our homes. I have never lost interest in fishing ever since catching my first fish. Fresh water never gave me the buzz of excitement here in the UK, compared with the endless variety that sea fishing can give you. Not knowing what you might catch from a Goby to a Dogfish or even a starfish. I should explain what my eBook title means to me, so you will understand its logic, layout and background. 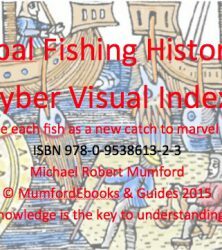 Cyber Fishing is my use of digital material from many sources, putting together many antiquarian prints, paintings and photographs, showing how humankind has fed and sustained itself over 1000’s of years. From spear, net and trap, to farm and factory ship. All these wonderful shapes and colours on infinite numbers of fish. In my opinion, the sheer variety of land creatures has been over-taken by sea creatures 2-1, or more. Life began in the ocean and then evolved to colonize the land, living fossils are still alive today. We must appreciate and protect our world from mankind’s greed and let us share in a green-peace forever and ever. We have always hunted wild animals for food. We quickly found farming nature provided us with more and by developing conservation areas, these are new ways to achieve sustainability globally. Our ancestors bred Carp in fishponds or fish traps easily made of willow. Larger traps were made of stone dam like structures open to the sea. When the sea went out, anything left in these shallow pools was caught. As the decline in fish stocks increases today with over-fishing, fishermen found more jellyfish in their nets than fish. With the oceans getting warmer and more polluted, this provides the ideal conditions for jellyfish to breed. We can help to stop it by reducing the use of drift nets and protecting our Turtles, as they have evolved over millions of years to eat jellyfish. Many illustrations are of rare fish prints to giant sport fishing photographs in global rivers, lakes, sea and oceans. All large fish are the breeding fish-stock, and where possible must be put back. It makes sense to catch-and-put-back all female fish with eggs so they can go on breeding. We have to protect and conserve our fish stocks by regulating commercial fishing, and increase fish farming for the long term. Author: Michael Robert Mumford, 27th September 2015.